Remember when a 1GB USB Flash stick was something to brag to your mates about? Well, the cost and capacity of USB Flash drives has come down considerably over the last few years, with Kingston Technology now launching a 128GB-capacity USB memory stick. Yes. You read that correctly. 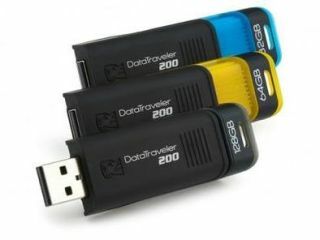 Kingston's new DataTraveler 200 series features 128GB USB memory stick! While the 128GB USB Flash drive is only going to appeal to a limited market (with its whopping $546 price-tag) the DT200 series also offers far more affordable 32GB and 64GB models ($120 and $213 respectively). Security is a no-brainer as all the drives feature password protection, so that even the most-lacksadaisical civil servant should manage to protect important government data they may want to upload to these (and then lose on trains!). The new DT200 series also features Windows ReadyBoost technology. For more head over to Kingston's website.